Lucy Flamm has been selected to receive the 2017 LITA/Christian Larew Memorial Scholarship ($3,000) sponsored by the Library and Information Technology Association (LITA) and Baker & Taylor. Flamm will be attending the University of Texas at Austin starting in Fall 2017 to earn a Master of Science in Information Studies and Master of Arts in Middle Eastern Studies. This Scholarship is for master’s level study, with an emphasis on library technology and/or automation, at a library school program accredited by the American Library Association. Criteria for the Scholarship includes previous academic excellence, evidence of leadership potential, and a commitment to a career in library automation and information technology. Flamm currently works as a freelance archival researcher and bibliographer. Prior to this she spent a year coordinating undergraduate and graduate access to print and digital materials, and developing and delivering workshops concerning academic resources and research methods at the first Palestinian liberal arts college. Her perspective has been shaped through her involvement with the Boston Center for Refugee Health and Human Rights and her experience as an intern for CyArk, where she supported ongoing efforts to digitally preserve tangible and intangible cultural heritage. During her undergraduate studies at Bard College, Flamm worked for the Bard Prison Initiative digitizing materials to be available to incarcerated individuals pursuing academic degrees, and her undergraduate thesis utilizing archival materials was awarded Bard College’s Marc Bloch Prize. 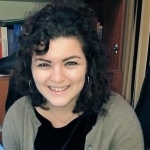 Her original research concerning archives as sites of politics in the Middle East has received international recognition, granting her the opportunity to present at conferences held by Smolny College (St. Petersburg, Russia) and the British Society of Middle Eastern Studies. Members of the 2017 LITA/Christian Larew Memorial Scholarship Committee are: Julia Bauder (Chair), Matthew Carruthers, Erin Grant, Cole Hudson, Soo-yeon Hwang, and Amber Seely. Thank you to Baker & Taylor for sponsoring this scholarship. News & Noteworthy awards, baker and taylor, scholarship. permalink.